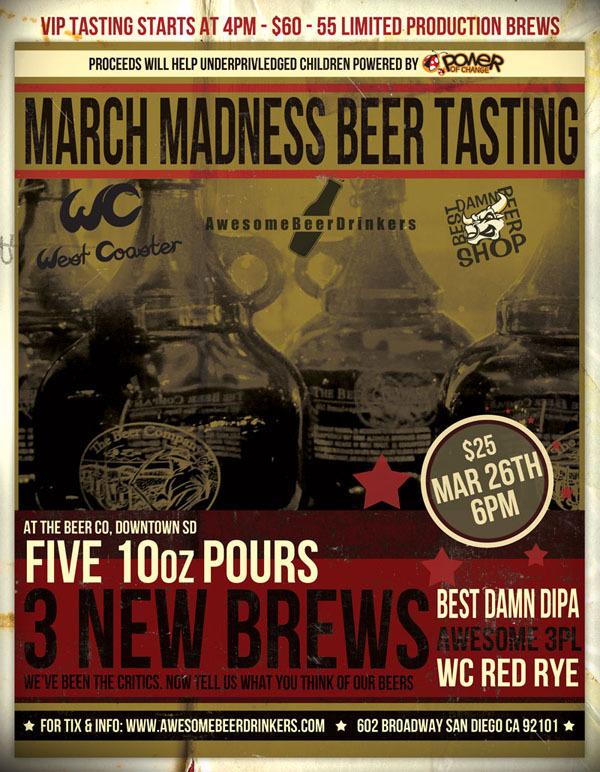 Posted by Jeff Hammett in bars and restaurants, beer stores, best damn beer shop, breweries, neighborhood, stone brewing co.
3/10/12 See update with info from Arsalun Tafazoli at bottom of post. I have no idea if this pint glass, adorned with the Neighborhood name and logo along with the Stone Brewing Co. name and gargoyle is a commentary by Neighborhood aimed at Sid Mikhail of Best Damn Beer Shop. If you know Sid you’ve probably been greeted by him with “Hey bro” at least once, it’s something he’s fairly well known for in the local beer community. I’ve had multiple people bring it up with me when talking about Best Damn Beer Shop. Granted some people don’t like it, some people find it a little odd, others just understand it’s the way the guy talks and don’t mind it (myself included). Neighborhood recently had a fairly public dispute with Best Damn Beer Shop when they announced plans to open a tasting room and off-premise bottle shop near their current bar/restaurant at 8th and G St Downtown (which happens to be just a few blocks from Best Damn Beer Shop). You can read more about that here (and be sure to read the comments). I’m perfectly willing to admit that there’s a chance that this has nothing to do with Sid and Best Damn Beer Shop, if that is the case it is a most unfortunate coincidence. Previously Arsalun Tafazoli said his opening a bottle shop wasn’t about competition but rather about building community in craft beer. If that’s really what he’s after this certainly isn’t the way to do it. Arsalun is a smart guy, and pretty on top of things, it’s hard for me to imagine that even if it weren’t his intention he wouldn’t know that some people might see this as a comment about Sid at Best Damn Beer Shop given what’s gone on between the two businesses recently. And just why is the glass co-branded with Stone Brewing Co.? 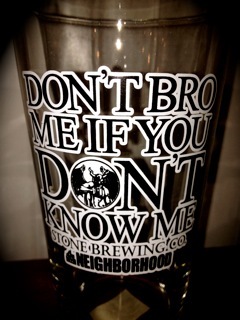 The glasses will be given away Tuesday night (March 13th) with the purchase of any Stone Brewing Co. beer at Neighborhood, when they’ll also be releasing for the first time a new custom blend which they just got ABC and TTB approval for, Stone Mixed Tape-GK & LU’s Blend Vol. 1 will be on tap for the first time ever. It’s a blend of Stone Levitation Ale, Stone LeVariation Ale (Levitation w/ our Belgian yeast strain), Stone Sublimely Self-Righteous Ale, Stone Smoked Porter, Stone Cali-Belgique IPA, 2011 Stone Imperial Russian Stout and 2011 Stone BELGO Anise Imperial Russian Stout with added notes of sage, peppers, lemon thyme, and Citra hops. As for the beer I’ll say it sounds interesting — in both the I am really genuinely curious how that will taste sense of the word, as well as the way one might stretch out the first syllable when they say the word, innnnnteresting, to denote that they might have a few reservations about it. One way to find out how the blend works out is to try it, 6pm Tuesday at Neighborhood, Koch will be on hand to see how folks respond to it. Update: Arsalun Tafazoli of Neighborhood wrote back to say this has nothing to do with Sid and Best Damn Beer Shop and that glasses were actually planned and made for a San Diego Beer Week event that had to be bumped due to scheduling conflicts. So it turns out that this is just a really unfortunate coincidence as I previously wrote could be the case. I asked around a bit before publishing this post yesterday and every one I talked to assumed this was aimed at Best Damn Beer Shop, so regardless of intention, I wasn’t the only person that interpreted it as such. Tafazoli’s email is below. Support was positive on Facebook and Twitter with a few people leaving comments in favor of it. One person said that it would be a great addition to East Village while another said he wrote an email to Cordova at CCDC to show support. But it turns out not everyone is looking forward to the possibility of Neighborhood opening a bottle shop downtown. Wow, just got call from the City only one to protest our retail license was @BestDmnBeerShop. Really??? pretty deceitful. You could have came to us in person and tried having a conversation. Its not about competition but community you schmucks. According to Tafazoli CCDC contacted him to let him know that Sadeer Mikhail (Sid at Best Damn Beer Shop (BDBS), and the son of the owner of Super Jr Market which houses BDBS) emailed to inquire about more information on Neighborhood’s plans and for information on how to petition the license application. Mikhail would not confirm nor deny that he wrote the email to CCDC which said in part, “I’m afraid if the Neighborhood Ale House opens up a bottle shop/tasting room it will dramatically effect us [Super Jr Market/Best Damn Beer Shop] directly considering we are 3 blocks away. Please let us know how we can petition this application for beer and wine off sell license.” The email also listed three other businesses that would be effected if Neighborhood were to open a bottle shop, though Mikhail later declined to provide me with any contact info for other business that would be effected. I don’t buy many six packs. In talking with other friends that I would consider beer nerds most of them don’t buy six packs much either. I realize we’re in the minority among the general beer drinking public. Six packs of 12oz are a great bargain compared to buying individual bombers, but personally I like to try a variety of beers, not the same six beers in a row. Because of this the ‘mixed six pack’ is something I really enjoy. It’s a simple concept: instead of buying a six of the same beer, you can mix and match buying singles of different beers. The term ‘mixed six pack’ is a bit of a misnomer, most shops that sell beer this way don’t actually require you to buy six beers, they’ll gladly sell you singles as well. Locally Best Damn Beer Shop and Bottlecraft are the only two shops that have really embraced this model that I know of. Olive Tree Market offers a few 12oz bottles as singles, but not many. Bottlecraft doesn’t really market a mixed six pack, rather they just break up their six packs and sell them individually. They have empty six pack holders handy if you need one to help carry things but there isn’t really the suggestion of mixed six packs. That’s fine, it all works out the same in the end. The individual bottle prices I’ve looked at are generally 1/6th of the price you’d pay for a six pack of that beer at other stores so there isn’t much of a premium for building your own six pack. Best Damn Beer Shop does market their individual bottles as a mixed six pack, but they won’t turn you down if you don’t want to buy six. Bottles are individually priced and from a quick look they appear to be just a bit more than 1/6th of the cost of a six pack of that beer. Many of the beers I looked at were $2 each (which would make a $12 six pack) but if you were to buy a sixer off the shelf of that beer the price would probably be a buck or two lower. To make up for this BDBS offers a ten percent discount for those buying a full mixed six pack instead of just one or two singles. Whether you’re like me, and don’t want the same six beers in your fridge, or just want to try different beers you’ve never had without having to committing to a full six pack, the mixed six pack is a good way to sample various beers at a reasonable price. Know of any other shops in San Diego that offer mixed six packs? If so leave a comment below. Update: It was pointed out in the comments below that Pizza Port Bottle Shop up in Carlsbad offers mixed six packs as well. I’ll start out by saying that Fantôme Magic Ghost is one of the most unique looking beers I’ve ever seen, the picture here doesn’t do justice to just how spectacularly green this beer is. Magic Ghost is said to be made with green tea, but I didn’t pick up any flavors that I would attribute to the use of green tea. I’m also assuming the green color of the beer is from food coloring, I don’t know that for sure, but can’t think of anything that would make it so vibrantly green. Magic Ghost is sweeter than most Saisons, but not overly sweet. The smell is reminiscent of a raspberry or strawberry cream soda with just a bit of musty Saison funk in there. The first thing I noticed upon the first sip was the prickly mouthfeel due to the high carbonation. Just like the smell the taste is on the sweet side and one of the first things I taste is strawberries and cream. Magic Ghost is fairly citrusy as well, my mind wanders towards lime, but I can’t help but think that’s just due to the color of the beer. The same thing goes for the kiwi flavor I’m picking up. Does this beer really taste like kiwi or is that just a trick due to the green kiwi like color of the beer? There’s some candied-ginger and lemongrass flavors in there as well, with the lemongrass becoming more noticeable as it warms up. 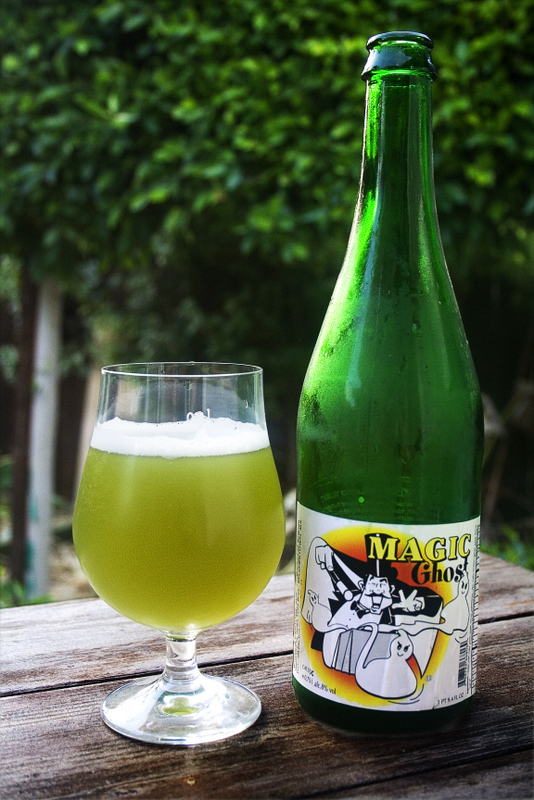 Magic Ghost is slightly tart, but nowhere near sour. A bit of typical Saison funk, presumably from the yeast is present as well, but certainly doesn’t take front and center over all the other things going on with this beer. Some people might call Magic Ghost a gimmick, but I call it a damn good (and unique looking beer). I picked this bottle up for $15 at Bottlecraft but according to their website they’ve since sold out. I know that Olive Tree Market and Best Damn Beer Shop got some in as well (and probably more shops around town as well). 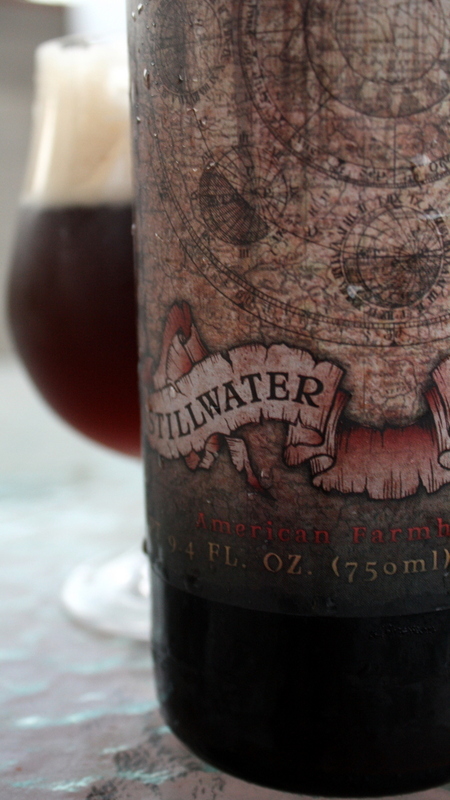 If you want to try this beer I’d say go out and get one sooner rather than later. And putting a couple of bottles away in a cool dark place until March 17th wouldn’t be a bad idea either. UPDATE: Dr. Bill brought to my attention that this beer was made with woodruff syrup, which is what gives it the vibrant green color. I’m not sure if there is green tea in it or not, but woodruff does explain the color. 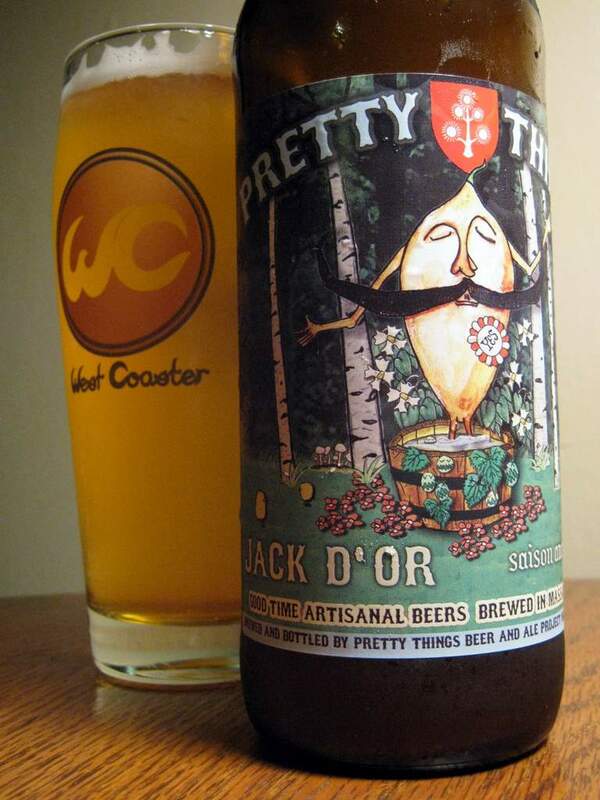 Jack D’Or is my first beer from Pretty Things Beer and Ale Project. Their solid reputation drew me to the beer in the first place, but the awesome label artwork sealed the deal (yes, I realize this is the second Farmhouse Friday in row I’ve more or less picked a beer because of nice label art, I don’t plan on making it a regular thing, although I haven’t been disappointed with either). 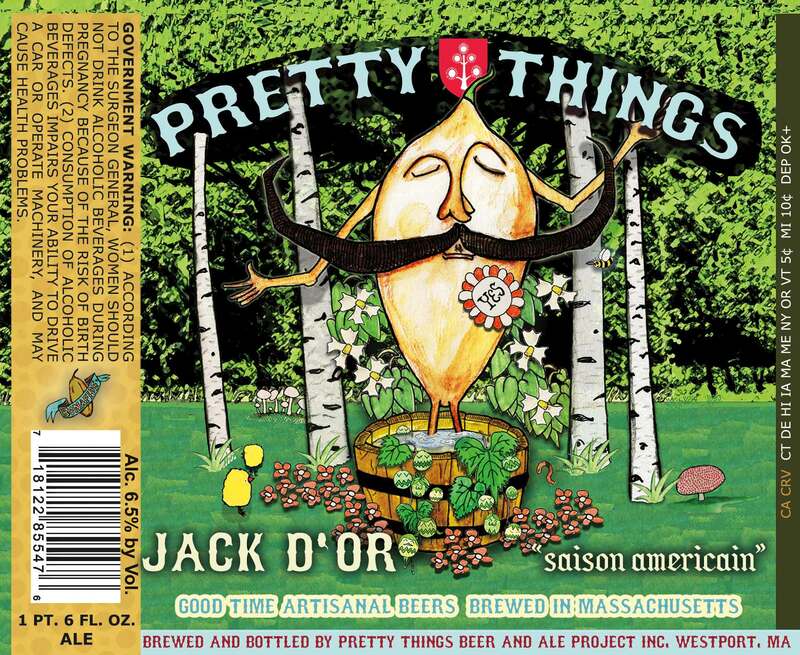 Jack D’Or is Pretty Things flagship beer and is described as a “Saison Americain”. I couldn’t find a description of what they meant by that term, but I imagine it to be a typical Belgian style saison with a decent dose of American hops. Jack D’Or uses no spices, only malt, oats, sugar, hops and yeast. I picked this 22oz bottle up at Best Damn Beer Shop for $8.99. It was labeled “Batch 22, Bottled Feb 2011”. I poured Jack D’Or into a large glass, but quite a bit of cloudy beer remained in the bottle. In the glass it was pretty clear, a straw color with lots of tiny bubbles and not much head. The smell was slightly sweet like bubble gum, with some citrus fruit and peppery spices. The taste wasn’t as sweet as I expected. Lemony, citrus and grassy hops with some peppery spice. Not to grainy at all. Pretty clean with a very dry finish. The mouthfeel was a bit thin but inline with the majority of saisons I’ve had, so probably right on for the style. Pretty Things Jack D’Or is an American hop forward saison, prefect if you want something a bit different. It seems to have roots in both the traditional saison style and hoppy American beers (I wouldn’t call this an IPA/Saison hybrid, it’s not quite that hoppy). I’ll gladly drink it again.